MDEP was established in 2006 as a multinational initiative to develop innovative approaches to leverage the resources and knowledge of the national regulatory authorities that are currently or will be tasked with the review of new nuclear power reactor designs. The nuclear regulatory authorities of 16 countries participate in MDEP, which includes 6 design-specific working groups and 2 issue-specific working groups. The Nuclear Energy Agency facilitates MDEP activities by providing technical secretariat services for the programme. The MDEP Policy Group (PG) and the Steering Technical Committee (STC) oversee the programme. The International Atomic Energy Agency (IAEA) also participates in key aspects of MDEP's activities. For more details, please refer to the terms of reference. to implement the MDEP products in order to facilitate the licensing of new reactors, including those being developed by the Generation IV International Forum. the co-operation on the safety reviews of specific reactor designs. A key concept throughout the work of the MDEP is that national regulators retain sovereign authority for all licensing and regulatory decisions. For more information on the MDEP's accomplishments to date and future work, please see this year's annual report. MDEP engages with key stakeholders involved in ensuring the safety of new reactor designs, manufacturing, construction and operation. At this time, these stakeholders include other national regulatory authorities and international organisations involved in ensuring nuclear safety including the IAEA, Western European Nuclear Regulators' Association (WENRA), NEA Committees on Nuclear Regulatory Activities (CNRA) and Safety of Nuclear Installations (CSNI), the various reactor vendors, nuclear component manufacturers, mechanical and electrical standards development organisations, reactor operators and licensees and key industry representatives such as World Nuclear Association (WNA). To this end, the MDEP has organised four conferences (in 2009, 2011, 2014 and 2017, to communicate its work with various stakeholders. The MDEP also issues press releases that cover the programme's major events and milestones. However, individual regulators retain sole responsibility for communication on specific new reactor issues. As of 22 May 2018, Mr Mark Foy, Chief Nuclear Inspector of the UK Office for Nuclear Regulation (ONR), succeeded Mr Petteri Tiippana, Director-General of the Finnish Radiation and Nuclear Safety Authority (STUK) as chair of the MDEP Policy Group. Working groups for each new reactor design will share information and co-operate on specific reactor design evaluations, construction, commissioning, and early phase operation. Participants in these working groups should be MDEP member regulatory authorities (or their technical support organisations) who are interested in a specific reactor design and are willing and capable of contributing positively to the group's activities. Design-specific working groups will be formed when three or more countries express an interest in working together. EPR working group was established to conduct the activities previously carried out by the US, Finland and France to share information on the EPR safety review. Current members are regulators from China, Finland, France, India, Sweden and the United Kingdom. AP1000 working group was established to share information on the AP1000 safety review. Current members are regulators from China, Canada, India, the United Kingdom and the United States. 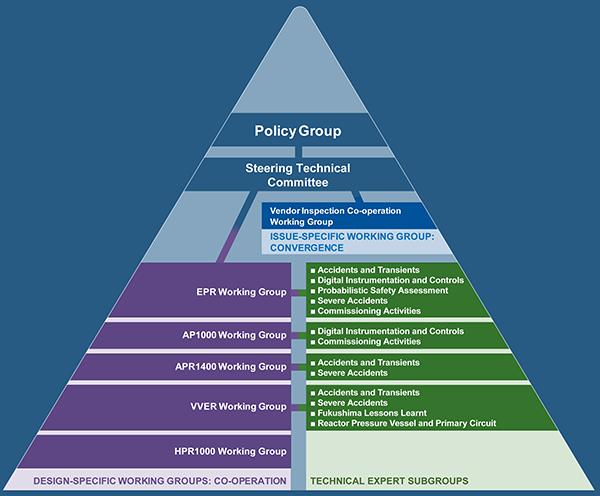 APR1400 Working Group was established in May 2012 to focus on the safety review of the KHNP's APR1400 design. Its members include regulators from Korea, the United Arab Emirates and the United States. VVER Working Group was established to share information on the VVER safety review. Current members are regulators from China, Finland, Hungary, India, Russia and Turkey. HPR1000 Working Group was established in September 2017. Current members are regulators from Argentina, China, South Africa and the United Kingdom. The products issued by the ABWR Working Group under MDEP are available here. The products issued by the Digital Instrumentation and Controls Working Group under MDEP are available here. The products issued by the Codes and Standards Working Group under MDEP are available here.